Colette Peters is one of the more well-known cake artists out there, and she's been doing amazing cakes for a while, long before Duff and Buddy hit the scene and became famous for it. Many years ago I bought her book, Colette's Cakes, and made the fish cake for my grandfather. It was his birthday, and he liked to go fishing. This was one of the first shaped cakes I ever made, and while I had worked with rolled fondant before, I wasn't at all experienced with painting it, as is obvious. The cake itself is super easy: just bake a sheet cake and cut the fish's body from one corner to the opposite diagonal corner going down the length. Kind of like an ellipse, only with a tapered end for the head. Then, cover it in rolled fondant, and while the fondant is still soft imprint the rows of scales using the wide opening of a piping tip. The fins and tail are rolled fondant that has been shaped and textured with a veining tool. 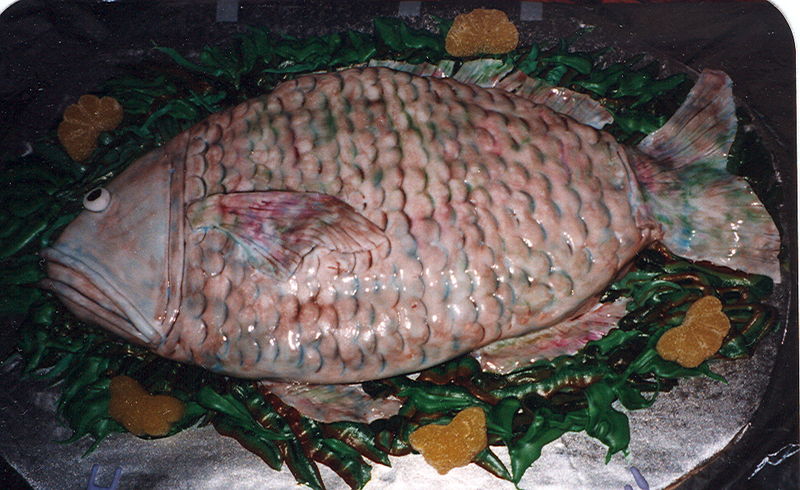 The mouth consists of two small, skinny rolled fondant snakes, and the eye is a flattened pea-sized ball of fondant with black food coloring painted on top. That was all simple enough, but still, it's pretty dang ugly, isn't it? Needless to say, my effort came out looking nothing like the fish cake in the book. That's because you're supposed to use blue and silver luster dust to paint it. Only I didn't have any blue or silver luster dust, and back then I had no clue where to get any, so I improvised with what powdered food colors I had on hand. I didn't have very much, and those can be pretty pricey, so knowing there wasn't enough to color the whole cake, I thought I could just dilute them with water and make a paint out of them. Wrong! Always add a clear alcohol to powdered colors and luster dusts when painting fondant or gum paste. But really, this cake should have had dry luster dusts brushed on it. The paint I made didn't adequately color the fondant. All it did was turn the whole thing into a wet, sticky mess. I tried to remedy this by coloring some piping gel and brushing that on the cake, which resulted in the picture above. The colors all pretty much ran together, and piping gel leaves a translucent, wet-looking finish, so it does look like a fish out of water, just not a very pretty--nor appetizing--one. No, that's not another one I made. 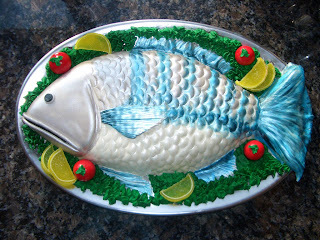 I found this gorgeous fish cake picture over on Flickr, and it's the work of indigojods. She actually has quite an impressive photo stream, with a lot of really beautiful cake pictures if you're interested in seeing more of her work. The tomatoes are a nice touch, and she modeled them out of fondant. I also like the candy orange slices she used better than the chunky ones I used around my cake. Nowadays luster dust is easy to find at specialty cake decorating supply stores or online. Wilton even makes some that you can buy at craft stores that carry their products. So, while I certainly should've used the right kind of luster dust, that wasn't an option available to me back then. Instead of piping gel, I should've either colored the fondant before covering the cake by kneading some food coloring into it, OR done a bit more research first. Winging it often gets the job done, but I didn't need to figure out the importance of using clear alcohol to make paint the hard way. I also think the piping gel was a mistake, but after my paint debacle, I had to do something to cover up the nasty wet fondant. But still, since it was a cake for family, nobody complained. Oh, and um... if I really want to be nit-picky: I should've lined up the scales better. They get a bit wonky in places, and that bugs me. I'm ambivalent about the leaves. I was trying to make them look more like seaweed, so I striped the piping bag with darker colors, but I think I went too dark in places, and the leaves themselves aren't all that great. But they're really no worse than the fish. 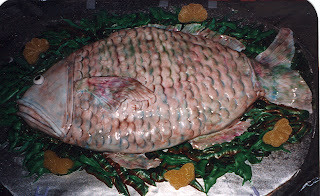 Lol- it is ugly-just like a real fish so very real looking if you ask me! Two ways to go with animals-realistic or cartoony! I don't know fish very well but it looks like a snapper or something. My moms new hub would love that. I agree with Jennifer I think it looks very realistic and I'm sure a real fisherman would be delighted to get this cake.